This post has been sponsored by 8thePlate. There are days when we have feeding therapy and I am just dreading it. I am not sure what she will eat, if it will go well, if we will hear her therapist mention, “regression” or say, “I think you need to start coming back weekly,” or things are just, “status quo”. My 3 year old Adeline has many reasons why she has difficulty eating. For those of you who are new here, Addie Belle was born premature and has many GI issues related to her prematurity; NEC, and malrotation & volvulus, failure to thrive, dysphagia, & has Short Bowel Syndrome. She is medically complex, she has had prolonged hospitalizations, NPO for extended periods of time, she received supplemental nutrition via IV (TPN) and enteral (feeding tube), and she has had fewer opportunities to achieve typical feeding milestones. She has many barriers that keep her from wanting to eat; pain, nausea, diarrhea, vomiting, sensory issues & oral defensiveness, (will not always brush her teeth, avoids certain textures, etc.). Working through this issue has been the most challenging of all her early interventions. How Did it Go for Us? 8 the Plate was created by a by a wife and husband team. Anesa Doyle is a Board Certified Behavior Analyst and husband, Joe Doyle, an aerospace engineer. It was created after Anesa was having difficulty with her own picky toddlers. 8 the Plate is a divided plate that spins inside a clear cover (= clear expectations), the plate only spins one direction so parents pick the order of the food, yet the child is able to spin the plate themselves with the over sized grip in the center. Made with Tritan from Eastman which is BPA, PVC, Lead and phthalate free, but still dishwasher safe! The plate was designed to increase the variety of foods your child is eating and decrease picky eating using research based methods. It was also created to reduce the overwhelming feeling during mealtime by offering 1 bite of food at a time, vs. an entire platter of a variety of foods with many bites. By offering 1 bite at a time, it is more achievable. 8 the Plate is designed to promote balanced eating which is a struggle for many of us whose children just want chicken fingers, pizza, and goldfish. Finally, it was devised to help create engaged mealtimes, increase independence, let’s children manage their own meal, and allow you to make a game out of the plate. ABA (Applied Behavior Anaylsis), is a science, founded in research, that is used to increase behaviors you want, decrease behaviors you do not want, and teach new skills. It is one of the most effective methods to teach kids with autism, but you can do ABA with anyone, anywhere, at any age. The creator of this plate is a BCBA (my kind of people), and I used to be the Director of Education at a school for kids that was created and designed based on the principles of ABA. 8 the Plate is based on the Premack Principle (First-Then), bite for bite, and also designed to increase behavior momentum. Hopefully I have not lost anyone, so let me explain. Premack principle is a common positive reinforcment strategy that is proven to be very successful. What you do is present an easier task, and then that will reinforce a more difficult or less preferred task and it is also called First- Then. “First you eat your vegetables, then you can have cookies” This principle can be used with anyone across all settings. 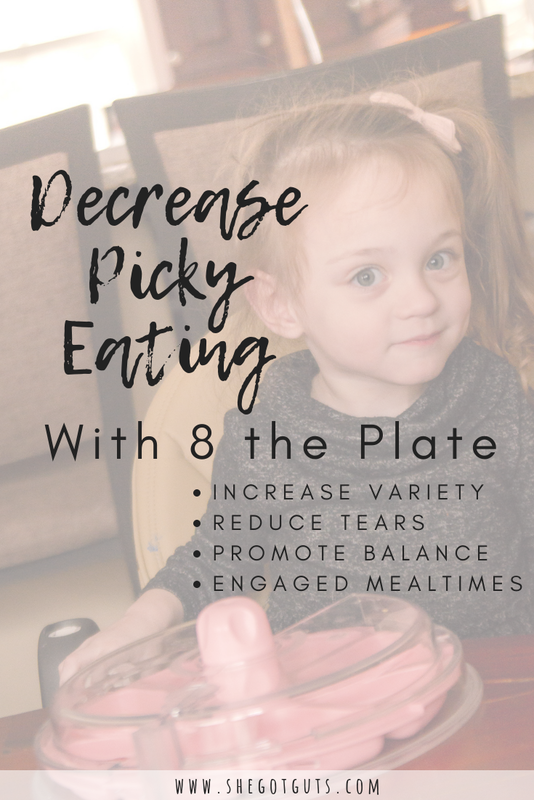 The way 8 the Plate is based on the Premack Principle, is because you fill the plate with highly preferred items (your child’s favorite foods, something they will always eat), and very few non-preferred items ( new food, less preferred food). The idea is that your child will be more likely to eat the non-preferred food items in order to have access to their preferred or favorite foods. It’s important to note that when I say “eat” the non-prefered or new food, it does not always mean Adeline has to smell, taste, chew, and swallow in order to have access to her preferred food. We really try to break it down into small steps and then we reinforce her gradual progress. For example, at first she may just have to touch a small bite, then kiss the food, taste the food, put the food in her mouth, and then chew, swallow. This progression is more comfortable for many kids with oral aversions, sensory, or medical issues and may not need to be utilized for a typical toddler with picky eating habits. Fill the plate with neutral foods, highly preferred food, and non-preferred or new food. Introduce the plate with a neutral food. Neutral food means they’re going to eat this food 100% of the time. When adding a non-preferred food, or new food. make the piece really tiny so it’s not too overwhelming. Start with 1 new food bite in the plate and it shouldn’t be more than 1/3 of the plate. Have your child help you load the plate and choose other things like their cup or the place they sit. You are still in control of the choices you give him, and make sure to include preferred and non-preferred choices. But this makes them feel like they are in control, they are more likely to eat what they put in the plate. By also letting them choose, you realize what they really want. When introducing a new food try chaining; making small variations on the food a child eats well to gradually introducing new varieties. Your toddler will be more likely to eat the new variety because it’s similar to a food they already like. For example; trying a different brand of chicken nuggets if they already eat chicken nuggets. Let your child choose, it tells you what they are motivated by. Do not let them have access to to the highly preferred food all day and only during mealtime! Make it fun!! Each time you turn the plate it clicks, so make sure when you hear that sound celebrate, reinforce! Keep offering new foods even if they have been rejected. Typically developing children can reject new foods 12-15 times before trying. Use a discard bowl or No Thank You Bowl that Adeline can use to put food in if she’s done with it, chewed it and spit out, did not like something particular on it (crumbs), etc. This decreasing throwing food on floor, etc. that she does not want. The first time we used this plate, I was cautiously optimistic. This was also because she had eaten nothing all day, and I did not know if this plate would be actually work. The reason why I was so excited about getting the plate and trying it, we because I loved the research methods it was based off of, and I will literally try anything to get Adeline to increase eating by mouth and trying new foods, but I did not want my hopes to be too high. The first time I tried the plate I made it fun, I told her the game was called “8 the Plate” and she would have to eat some bites and she would be the winner by eating all the way to number 8! I let her pick one food, and she choose M&Ms, (I let her choose from cookies, M&Ms, and muffins, because these foods are highly preferred). When introducing the plate, I filled it with M&Ms (highly preferred) and small pieces of strawberry ( neutral food, that she usually eats). On the very first introduction of this plate, on a day she did not eat anything, SHE ATE THE ENTIRE PLATE!!!!!!!! She finished all her strawberries, because she was so motivated by getting the M&Ms. There was one bite of strawberry she spit out, because it had a weird taste (she placed it in her No Thank You bowl), but kept it moving. She did try to reach under to access the M&Ms, but I told her she could not have them until she ate the strawberry first. I celebrated each “click” and at the end we really celebrated and even told Daddy she won the game because she “8 the Plate!”. We filled the plate this way a few more times with just highly preferred and then neutral foods. We kept the bites small, let her choose the items, and really kept it fun. Then I started to introduce more non-preferred foods, and I started with eggs. This was something she used to eat, but has to decided it’s no longer something she wants. I decided on eggs since I am trying to get her to eat foods with more protein, fat, and she is not a fan of meat. When we first started with a non-preferred food items, I decided the requirement would be that she would just have to “kiss’ the egg, to be able to move on to the next food item. Once she kissed it, she could place in No Thank You bowl, and move forward. This gradual introduction is more appropriate for her and we can build upon it by then making her taste, chew, and swallow. This also mean she had the chance to be more successful during the beginnings of trying something new. She is doing great!!! She has been moving through the plate and keeps winning! We are using the plate 1x per day, and not during dinner (which is strictly for family time, enjoyment). This is just a personal preference while we are introducing the plate, new foods, etc. and many families use this during dinner. She has officially added eggs to something she will taste, chew, and occasionally swallow. We’ve had days where she has not wanted to eat anything, and on those days we’ve decreased some of the demands by filling less of the plate, only requiring she has to kiss the food, etc. So run and get your plate now (make sure to use my discount code!) and add this as part of your routine when trying to expand what your little one eats.